Rodney Morris of the United States of America is one of the players in the upcoming International Pool Tour challenge match "East vs. West II." Morris was the runner-up in the International Pool Tour's World Open, losing to pool legend Efren Reyes. Mr. Morris was gracious enough to take part in a short Q&A with IPT staff. Please take a few minutes to get to know one of the best players in the world. You can also read his prediction about the outcome of his match against Marlon Manalo on March 4th! The live match will take place on Tuesday, March 4th, 2008 at 9pm (eastern). The game is 8-Ball, and the first player to win fifteen games takes the match. Viewers can watch the live stream absolutely free by being a Basic Member of the IPT web site. We suggest registering early so that viewers don't miss the beginning of the live broadcast. Registration is simple and takes just a minute. There are absolutely no costs to become a Basic Member- This show is just pure pool for anyone who wants to watch two famous champions represent their respective countries. Become a Basic Member Today- It's Free! Also, please share this free broadcast with friends, family, and colleagues by forwarding this email to them. 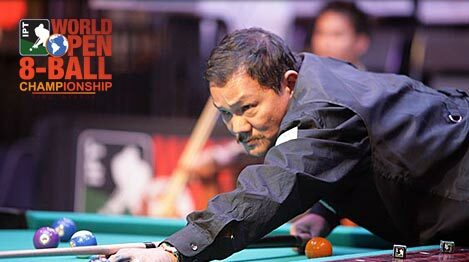 Marlon Manalo of the Philippines is one of the players in the upcoming International Pool Tour challenge match "East vs. West II." Manalo was the runner-up after losing on the hill to Thorsten Hohmann in the International Pool Tour's North American Open. Mr. Manalo was gracious enough to take part in a short Q&A with IPT staff. Please take a few minutes to get to know one of the best players in the world. You can also read his prediction of the outcome of the match against Rodney Morris on March 4th! The International Pool Tour "East vs. West" match, takes place live in only three days. 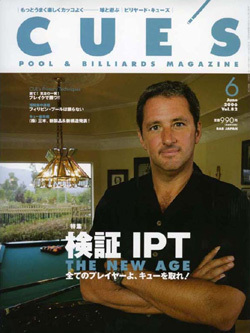 On January 23rd, 2008, at 8pm (eastern), Francisco Bustamante (Philippines) will take on Corey Deuel (U.S.A.) in a race-to-fifteen 8 ball match. The live match will stream on the International Pool Tour web site. Meet the players here! Viewers can watch the live stream by being a Basic Member of the IPT web site, which is absolutely free . We suggest registering early so that viewers don't miss the beginning of the live broadcast. Registration is simple and takes just a minute. There are no costs to become a Basic Member- This show is just pure pool for anyone who wants to watch two famous champions represent their respective countries. Become a Basic Member Today- It's Free! Invite a friend, colleague, or family member to register and watch this great match. There is no easier way to promote the sport than to forward this email to friends, colleagues, and family members. This is going to be a great match. Remember, if you haven't already registered for the match, please do so early. Reports from the Derby City Classic state that Francisco Bustamante has secured the 2008 "All-Around" Championship. The IPT congratulates Mr. Bustamante on this prestigious accomplishment. 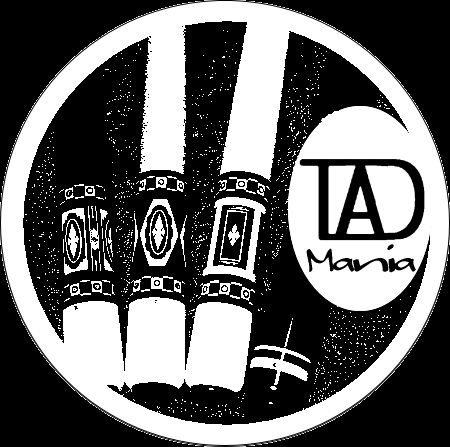 The Derby City Classic is put on by Diamond Billiard Products, the makers of the official IPT Table. On the 23rd of January, you will have the opportunity to see this great champion play live. The International Pool Tour presents "East vs. West," an IPT Challenge Match. Bustamante will face Corey Deuel, a top American Player. These two players have radically different playing styles, and they are going to clash live, on a free broadcast on the International Pool Tour web site. Meet the players here! 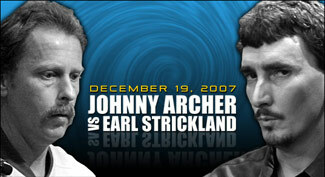 The live match will take place Wednesday, January 23rd, 2008 at 8pm (eastern). The game is 8-Ball, and the first player to win fifteen games takes the match. Viewers can watch the live stream absolutely free by being a Basic Member of the IPT web site. We suggest registering early so that viewers don't miss the beginning of the live broadcast. Registration is simple and takes just a minute. There are no costs to become a Basic Member- This show is just pure pool for anyone who wants to watch two famous champions represent their respective countries. Become a Basic Member Today- It's Free! Also, please share this free broadcast with friends, family, and colleagues by forwarding this email to them. Challenge Match #2 "East vs. West"
The International Pool Tour presents "East vs. West," the second IPT Challenge Match. The two countries that are represented in this challenge are both powerhouses in the world of pool. The United States of America has been one of the most dominant pool countries for over 100 years! However, the Philippines has produced many of the game's greatest players of the last 30 years. Both countries are represented by one of their legendary players. The two players competing in this match have radically different playing styles, and they are going to clash live, on a free broadcast on the International Pool Tour web site. Meet the players here! Thank you for your ongoing business and support of the Members Club. It is with pleasure that we announce a new phase of growth for the Members Club. Many of the long-awaited matches from the King of the Hill event are finally being completed and will start to become available for on-demand viewing. Since there are numerous matches, we have set up a poll that will allow you to have your say in which matches are completed and put in the members’ area first. If you go to our homepage www.internationalpooltour.com you will see the poll with a list of the first group of matches. Cast your vote for the match that you would like to see first. The poll will run through next week after which time matches will begin to be added for viewing. I hope that you cast your vote in the poll! Again, we thank you for your continued business. We anticipate delivering these new matches with regularity now that many are in post-production. Also, we plan to deliver some interesting new programming exclusively for the Members Club. You will be notified with any announcements well ahead of time. We are all very excited that the library of matches is expanding and hope that you will be too. I wish you great happiness in your marriage. It is hoped forever that it is happy. The International Pool Tour is about to kick off the 2007 Tour Card Qualification System. Here is your opportunity to secure a spot on the 150 player IPT 2007 Tour! The IPT is hosting qualification tournaments throughout the world starting this Friday! The top two finishers in each of these events will win an entry into the 2007 Tour Card Tournament where the top 50 players will earn a 2007 Tour Card. And, each qualifying player will also win free airfare to the tournament as well as a hotel room. No matter how many players enter each tournament, two players will earn spots in the tournament. Each tournament will be a Double-Elimination competition with races to ten. The Two players from each tournament who will qualify for the 2007 Tour Card Tournament will be the winner of the winning side and the winner of the losing side of the brackets. Players who place 3rd-6th will receive a free entry to another qualification tournament of their choice. IPT Rules, which can be read on line, govern each tournament. There is very limited space at each event so entries are based on a first-come, first-served basis. Do not miss this chance to play on the IPT tour by failing to register in time. On line registration is the only way to enter these events and the form is on the IPT web site www.internationalpooltour.com. Absolutely no entries will be allowed at the tournament; no money will be accepted at the events. And remember, each qualification round typically has the smallest and weakest tournaments in the first few weeks, so signing up for the early tournaments gives players the best chance to win. What is a 2007 IPT Tour Card worth? Every 2007 IPT Member is guaranteed a minimum of $100,000! By visiting www.internationalpooltour.com you can choose to register for one or more qualifying tournaments. Entry fees are $2000, although you can receive a 10% discount by being an IPT Members Club Member. Click here for details on membership. Once you enter on line, you will receive an emailed receipt. Shortly thereafter, you will receive an email which will contain all of the information you will need to know about the venues, dates, times, etc. We hope to see you on the tournament trail! You can also visit www.internationalpooltour.com to see tournament coverage from each of these IPT qualification events. Here is a list of the first ten tournaments to be held starting Friday; cutoff for entry is Thursday at 4pm (CST). Someone One Day Closer to $500,000! Round one of the historic $3 million IPT World 8-Ball Open Championship is officially in the books. Eighty players will not advance and will have to be satisfied with only $5,000. Click here to see who will advance to Round Two. Conditions seemed to be tougher today as the humidity began to build – maybe because of the noticeably larger crowds in attendance today. The moisture caused the cloth to slow down and the pockets to play tighter. There were more than a few rattled balls and plenty of frustrated players. It only gets tougher tomorrow as the remaining 120 players will each play every session and use all 60 tables. 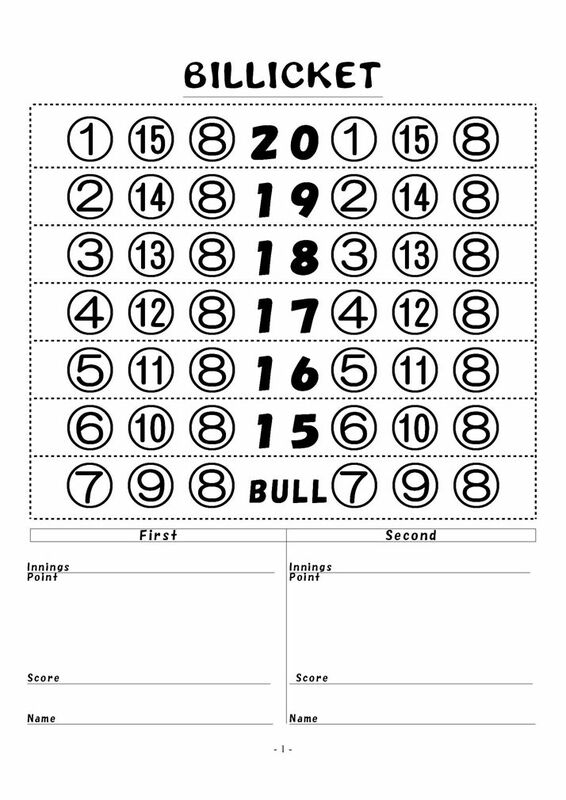 Click here to see the groupings for Round Two. The IPT has had professional sports photographers at work all day, and the online photo gallery is packed with over 1,500 pictures of the action. Click here for the photo gallery. The IPT’s exacting standards have yielded a few casualties today. Phenolic cue tips cut short the runs of Hall of Famer Ed Kelly and Sweden’s Tom Storm, who both were disqualified for using the banned equipment. At least five dress code violations cost players a total of $5,000. The IPT’s television production team was on the floor capturing initial round action, including the highly anticipated match between undefeated players Earl Strickland and Jasmin Ouschan. Earl did not disappoint the crowds with his antics, and Jasmin made it quite uncomfortable for him until he finally pulled ahead from a 6-6 twelfth game to win the match 8-6. Even if you can’t make it to Reno, you can still join in on the action because the official IPT Members Club has gone live! Starting Thursday, fans will be able to watch the tournament live online. Do not miss this chance to watch the action as players compete for the $500,000 first prize, or their share of the unprecedented $3,000,000 prize fund. Click here for details. 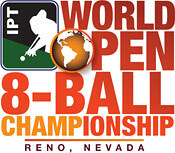 The action starts today, Sunday, Sept. 3, and all the players are in Reno for the $3 million World Open 8-Ball Championship at the Grand Sierra Resort & Casino. The winner of this historic tournament will receive an unprecedented $500,000 first prize! The World Open 8-Ball Championship is the biggest tournament in the history of the sport. Live coverage of the event including player stats, pictures, groupings, and more is available on www.internationalpooltour.com. In addition, starting Thursday September 7, live streaming video from the television table will be available! Don’t miss your chance to see this event live! The billiard glitterati from around the globe gathered for a player’s meeting that revealed some big news for the International Pool Tour. Some last minute changes in the line up have added Rudolfo Luat of the Philippines and Michael Schmidt from Germany. They will take slots vacated by George SanSouci of New York, who had to withdraw for personal reasons and the U.K.’s snooker great Ronnie O’Sullivan is out with a recurring ear infection. A change in the payout schedule means that every game makes a difference in the money – even if a player can’t advance to the next round, he can still move up in the payout. After the first round, players eliminated will receive payouts based on their rank within the eliminated group. Rank is determined by number of wins, first, then by game winning percentage and then the number of break-and-runs. In keeping with the IPT’s philosophy, this will ensure that every match, every game will be hard fought. While the IPT doesn’t use a shot clock, new time limits will keep the action moving along. In a given match, there must be three games on the wire by the 30-minute mark. If the game is lagging, a referee will watch the game to see which player is slowing things down. After an hour, there must be seven games, 11 after 90 minutes and 13 after two hours. After two hours, 15 minutes, the match over, unless the score is tied. This will deliver quick-paced action to the live broadcast audience. “We want every player to play every game with total effort and focus,” said Tour Director Deno Andrews. An IPT Web site membership will be able to watch the tournament live as it’s streamed over the Internet. Access to instructional segments and past tournaments along with many other benefits come with the IPT Web site membership at www.internationalpooltour.com. 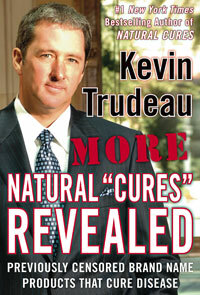 IPT founder Kevin Trudeau told an appreciative crowd that the tour is “ahead of schedule,” on all fronts. He had great news about television broadcasts: OLN Network, which will become Comcast’s Versus network on Sept. 25, will allocate a Saturday night slot in primetime for IPT broadcasts. Trudeau said that the IPT is in negotiations with broadcasters in Asia, New Zealand and Canada among others to pick up the IPT shows. Trudeau also announced that he’s received over 100 proposals for sponsorship from a variety of companies, and that Vonage and Dish Network have signed on as sponsors for this week’s tournament. While there was plenty of good news at the players’ meeting, there was some bad news, too. Andrews announced that the IPT Players 8-Ball Championship scheduled for Oct. 22 29 in London, England, has been cancelled due to problems in negotiations with the facility. However, the IPT will guarantee a minimum of $13,000 for the year for every player who plays in all the 2006 tournaments. The IPT will write a check to make up the difference. Finally, Trudeau announced that the IPT has entered into an agreement to be acquired by Ho Interactive, a new company started by casino owner billionaire Stanley Ho, who also owns online gambling site www.hocasino.com. Trudeau said that Ho Interactive will be taken public on the London exchange at some point in the near future. Players wrapped up practice on the 50 Diamond IPT-specified tables at about 9:15, ready for action to begin at 10 a.m. Sunday. Each tournament day will see five rounds of play, so check out www.internationalpooltour.com anytime throughout the day for the best tournament coverage in the history of the sport. Rico Dicks and Dave Matlock to fill two open spots in the World Open! The International Pool Tour announces that Rico Diks and Dave Matlock have accepted the IPTs invitation to fill two open spots left by Hall of Fame legends Buddy Hall and Jim Rempe, who both dropped out of the World Open citing personal reasons. Diks, and Matlock, based on a number of criteria including their third place finishes in the World Open qualifiers as well as their high finishes in the North American Open ( click here for results). Both Diks and Matlock were thrilled to be invited to compete in the World Open. The official player groupings will be released at midnight (CST), Thursday August 31, 2006. Visit www.internationalpooltour.com for details. The International Pool Tour announces the official player groupings for the IPT World Open 8-Ball Championship. The tournament starts Sunday, September 3, 2006 at 10am in Reno, Nevada at the Grand Sierra Resort. This historic event boasts the biggest prize fund in the history of the sport. $3,000,000 is the total prize purse, and the winner of the tournament will win an historic $500,000! 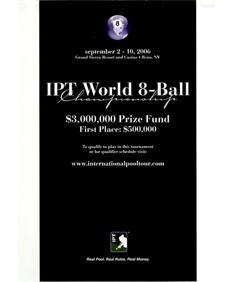 The International Pool Tour Official 2006 Money List Rankings will be published on Monday August 7, 2006. Money List ranking criteria are as follows: Money won, if tied then total number of matches won, if tied then game winning percentage (W%), if tied then total number of break and run-outs, and if tied then total number of eight balls made on the break. The next event is the IPT World Open, which will be seeded based on the Money List rankings. The IPT World Open is just around the corner. 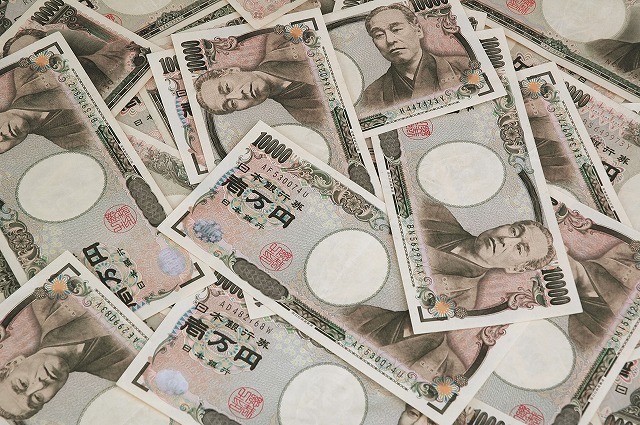 This open event is the next tournament to contribute to the Money List rankings. The tournament is a 200 player tournament consisting of 150 IPT Tour Members and 50 players who can win their spots in any number of qualification tournaments being held around the world this month. Click here to learn more about how to enter and play in the World Open qualification tournaments. Don't miss this opportunity to get on the Money List and fight for a 2007 Tour Card - click here to learn why! Also, check out the latest action in the qualification tournaments by visiting the IPT's on-line coverage of these events at www.internationalpooltour.com. 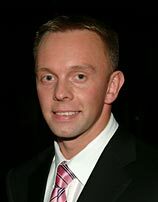 Congratulations on player Thorsten Hohmann and the victory! Thorsten Hohmann Wins Pool's Biggest Prize! 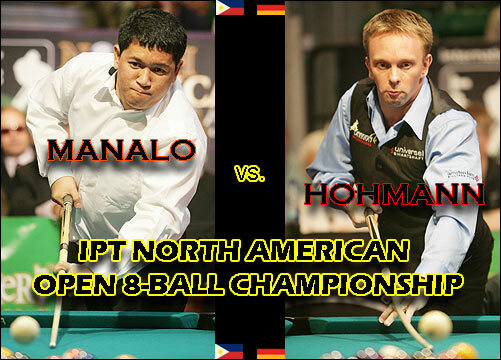 The most historic event in pool history has just concluded with Thorsten “The Hitman” Hohmann winning $350,000 for his double-hill victory over “Marvelous Marlon” Manalo. Complete with Michael Buffer announcing his trademark phrase, modified for the occasion to “Let’s get ready to rack ‘em!” the IPT’s first major event was an unqualified success. Two of the best players in the world performed in front of a wall-to-wall crowd, and the set was classy and striking. Manalo had chosen Jose Parica as he corner man, while Charlie Williams was in Hohmann’s corner. Empty breaks seemed to plague Manalo throughout the match, but the layouts were coming up pretty cut and dried. Both were playing fluidly—Manalo missed one combo attempt, and Hohmann rattled two balls, but everything came to a head when the score reached 6-all in the race to 8. Hohmann broke and popped the cue ball into the side pocket, and Manalo chose solids and ran out to reach the hill. However, he came up empty on his last break. Hohmann opted for stripes and played a perfect out, joining Manalo on the hill. The German showed no anxiety, just determination as he approached the table for the last time. He broke and made the 9 ball. With an easy layout, he had no trouble as he swiftly cleared the table, winning the final match 8-7. In doing so, he won the biggest prize in pool history, $350,000. Manalo earned $99,000 for his second-place finish. Tour founder Kevin Trudeau presented Hohmann with the money in a silver briefcase, as well as an enormous silver trophy. Calmly, Hohmann made a short speech, thanking Trudeau first and then praising the audience, his friends, his corner man, and his sponsors. The IPT’s next major event will be held September 2-10 at the Grand Sierra Resort & Casino in Reno, NV. First place will award a stunning $500,000, with a total prize fun of $3,000,000. Be sure to be there! Click here for tournament results, statistics, pictures, and stories from the IPT North American Open 8-Ball Championship! Hohmann & Manalo Make It! It will be Europe versus Asia at the finals of the International Pool Tour’s North American Open 8-Ball Championship. 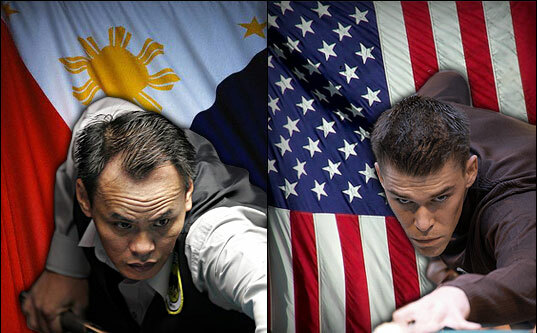 “Marvelous Marlon” Manalo and Thorsten Hohmann "The Hitman", the last two standing out of the original two hundred, will play each other at 1 p.m. Sunday afternoon at The Venetian. Be sure catch game-by-game online coverage of this historic event. No one knew going into the day where they would end up when it was over, but Marlon Manalo looked like a sure thing as he amassed four wins and only one loss. Evgeny Stalev, Ralf Souquet, and Efren Reyes were slow starters and fought hard for the wins they put under their belts today. Hohmann also started off tentatively but came to a smashing conclusion. And Dennis Orcollo looked strong throughout, making it impossible to predict Sunday's lineup. Again, it all came down to the final round, where no one knew for certain if new Filipino sensation Orcollo or former world champion Hohmann would advance to play Manalo, who cemented his spot in the previous round, in Sunday’s finals. But when Hohmann scorched Manalo 8-1, it was a done deal. Orcollo matched up with Evgeny Stalev on the opposite table and struggled through, winning 8-5 over the streaky Russian. And, last to finish Saturday evening, Efren Reyes and Ralf Souquet had an epic hill-hill battle in which “The Magician” pulled off another win. While two spots remain unclaimed, four places were determined by Saturday’s matches: Stalev earned $40,000 for sixth place, Souquet took $50,000 for fifth, Reyes won $65,000 for fourth, and Orcollo received $80,000 for third. With the incredibly large difference of $251,000 between first and second places, both players will be playing at their very highest levels. The hatchet came down on half of the 36-player field after Thursday’s last round at the North American Open 8-Ball Championship. The brutal, five-round format killed off 18 players who earned $17,000 for their 19th-place finishes, while 18 remain to attempt to carve out a bigger piece of the incredible $2,000,000+ prize fund. In Friday’s rounds, players will be guaranteed at least $30,000 each for tying at 7th place. Of the 18 players to advance, 5 made it to the IPT’s multi-million-dollar event through qualifiers—Rico Diks, David Matlock, Rodolfo Luat, Ronato Alcano, and Larry Nevel! From the Filipino contingency, nine began the day, and seven are left. Not a bad average. Those that will not be returning are Santos Sambajon Jr. and Antonio Lining. “The Magician” squeaked by into Friday’s rounds by coming out ahead in the hill-hill bout he played against Mick Hill of the U.K. While running the table, Reyes came within a hair’s breadth of scratching after pocketing the 8 ball in the corner, eliciting a huge gasp and then a burst of applause from the substantial crowd. Earl Strickland engendered controversy during his second-round, televised match with Nick Van den Berg of Holland. Strickland made several comments to Van den Berg’s family members who were in the audience, and things escalated from there. In an interview later, Van den Berg called Strickland “a disgrace to the sport,” while Strickland was unrepentant, saying, “I know I’m a terrible person, but you still have to show me some kind of respect.” IPT Tour Director Deno Andrews is investigating the situation. Behavior that is deemed unsportsmanlike conduct can result in a suspension or loss of a Tour Card. Strickland’s day came down to a hair-splitting match with Ronato Alcano, who won the Manila stop of the ferocious 2005 San Miguel Asian 9-Ball Tour and celebrated his 34th birthday today. Though Alcano held an early 4-1 lead, from there it was every man for himself, and it turned out to be another nail-biter. 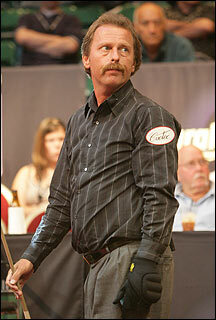 In the very last rack, Strickland still had two object balls on the table but couldn’t make either of them. Instead of opting to play safe, he blasted them, and Alcano was able to run out (though he left himself an almost 45-degree angle on the 8!) for the win. Alcano advances, Strickland is eliminated.